Egyptian officials say salvage experts have located the wreck of a ferry which sank in the Red Sea almost two weeks ago killing about 1,000 people. Transport Minister Mohamed Loutfi Mansour said the al-Salam 98 was found in 800m (2,600 ft) of water, 90km (56 miles) from Egypt's port of Safaga. He said experts would lower a robotic submersible to take pictures and search for the vessel's voyage data recorder. 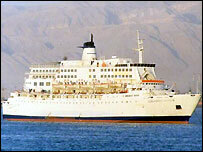 Only 388 out of more than 1,400 people on board survived the disaster. Ships carry a voyage data recorder, similar to a plane's black box, to record information about the vessel's location, direction of travel and weather conditions. Mr Mansour said the Egyptian authorities were now working with international salvage experts to try to recover the device from the al-Salam Boccaccio '98, which was operated by El-Salam Maritime. When they launch the salvage mission at the weekend they will also photograph the wreckage in an effort to establish why the ship sank. It is believed that the 35-year-old ship, which was sailing in bad weather, ran into trouble when a fire broke out below decks. The accident has prompted accusations of negligence, with the crew accused of ignoring warnings to evacuate after the fire took hold and the ship began to list. The anger of relatives has increased because of a lack of information about their loved ones, most of whom were Egyptians working in Saudi Arabia. Silence from officials fuels relatives' anger, says Ian Pannell.